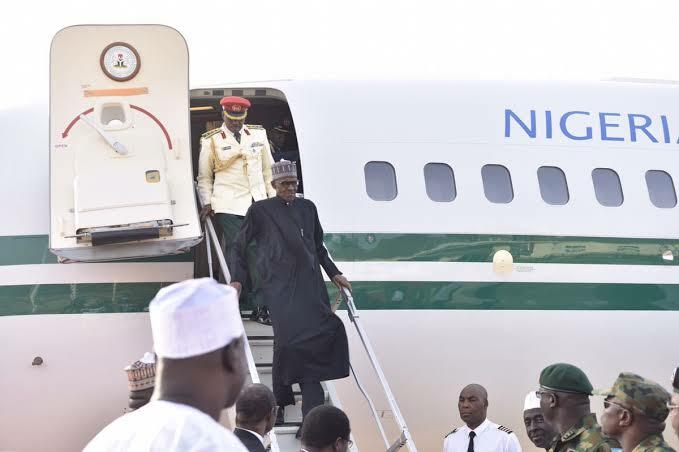 The jet conveying President Muhammadu Buhari has touched down at the presidential wing of the Nnamdi Azikiwe International Airport, Abuja, even as the President stepped out by himself. The presidential jet, Eagle One touched base at about 4:35pm on Saturday. The President has been away in London for medical vacation for over hundred days ago. The Vice President, Prof. Yemi Osinbajo is leading top government functionaries to the presidential wing to receive Buhari. Others at the airport are: Governors Rochas Okorocha of Imo; AbdulAziz Yari of Zamfara, Mohammed Abubakar of Bauchi, among members of the Federal Executive Council as well as presidential aides. The Nigerian Police mounted the Presidential Guard of Honour at the Presidential Wing of the Nnamdi Azikiwe Airport, Abuja.